With the holidays coming up, there’s a lot of eating to be done, and therefore a lot of cooking and sharing. 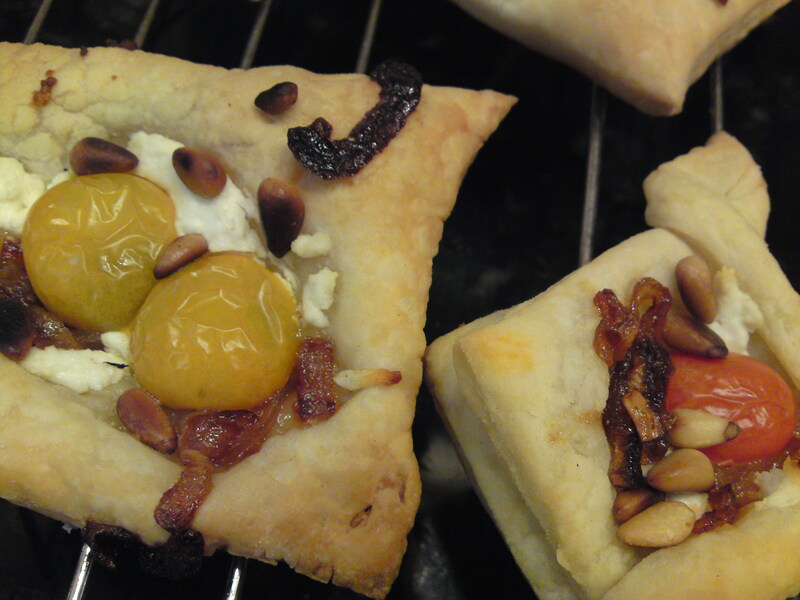 One of my favorite and absolute easiest appetizers to make is whatever’s-in-the-fridge-on-puff-pastry. I usually have two or three cartons of frozen pastry on hand this time of year, ready to take out and load up with goodies. 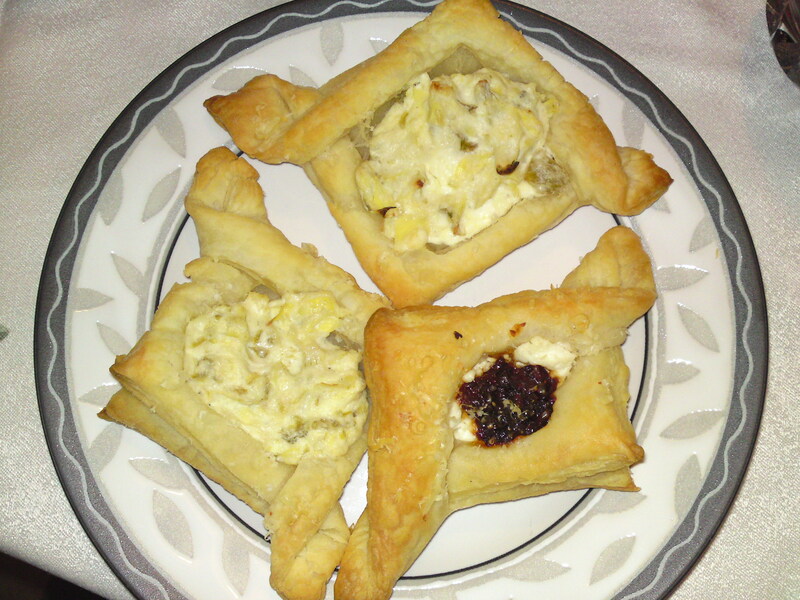 In less than an hour, I can have scrumptious appetizers ready to serve. Anybody can. Don’t always have an hour’s notice? Defrost some puff pastry sheets, lay them flat between parchment paper, and keep them in the fridge just waiting for those unannounced guests to drop by. I’m guessing they’d keep for at least a couple of weeks, but I’d bet they’ll never last that long. Need I go on? The list is limited only by your imagination and the contents of your refrigerator. Go ahead, experiment. Got a sweet tooth instead? Hmmm… what about peanut butter and chocolate chips in a Reese’s-like concoction? Topped with a dollop of vanilla ice cream? Yep. I could do that… right now! I used to just unfold the sheet of pastry dough on a floured board, cut it into 9 or so squares, plop some stuff on top and bake. Then my lovely friend Rosa taught me a little trick that kicks the presentation of these beauties — and their ability to hold a good amount of toppings — up a notch or two. It’s as easy as 1 2 3. 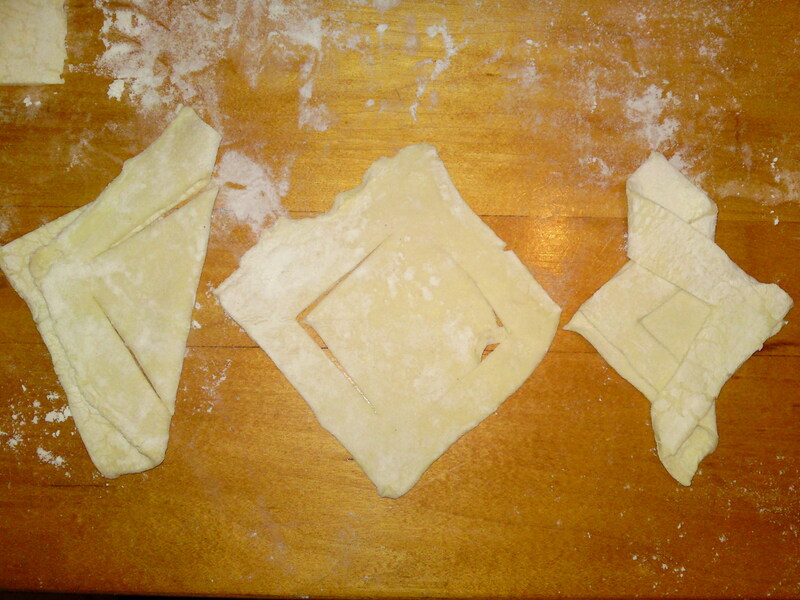 Cut the thawed, floured pastry sheet into squares — as many as you’d like, but smaller than 2″ x 2″ might be tricky to fold. Fold the square in half and cut along the two short sides — all the way down to the long end, and almost , but not quite meeting at the point. Unfold, and cross the cut-through points over to the other side. Voila! 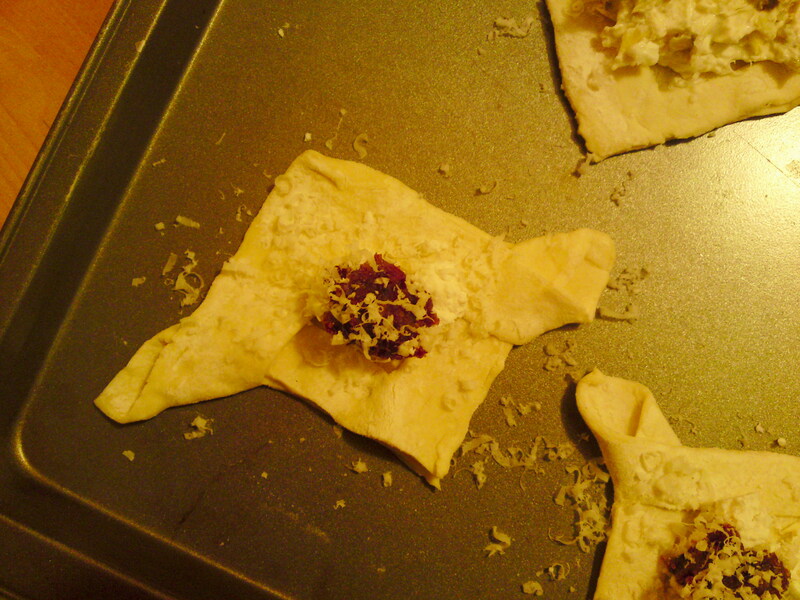 You’ve just made a beautifully shaped appetizer, complete with a cavity to fill and even a handle to hold while eating! I grated a bit of Parmigiano over the top, baked them in a 400 degree oven for 15 minutes, and wow! I would have no problem making a meal out of these. Maybe I’d add a side of soup for nutrition’s sake, but the smallest bowl I could find. Special thanks to my friend Helene who turned me onto the bacon marmalade! Serve warm, and don’t forget the wine! These look so good I will definitely have them on hand for the holidays.